This article is about the card. For the quest, see Alfe Fyr (quest). For the character, see Characters#Alfe Fyr. 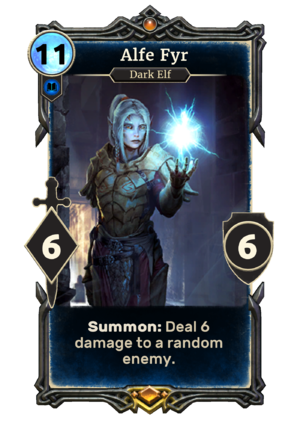 Alfe Fyr is a unique legendary Intelligence creature card. "We don't accommodate barbarians or peasants." Enemies include both the opponent and the opponent's creatures. Aside from card name and audio, Alfe is identical to her "sisters" Beyte Fyr, Delte Fyr, and Uupse Fyr. Alfe and her "sisters" are female clones of Divayth Fyr whose names are alphabetical identifications, and first appeared in Morrowind. This page was last modified on 16 February 2019, at 15:51.